Lots of new music this week! 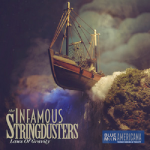 The Infamous Stringdusters, John Craigie, Ryan Adams, Whitney Rose, and more….we just can’t keep a lid on it here on Sonoma County Community Radio. A regular tribute set is in store as well with Dave & Phil Alvin and the music of Big Joe Turner. Also listen for music from Willie Nelson, Chuck Prophet, and Rhiannon Giddens this week.